Getting a review sample of this unique ultrasonic record-cleaning machine took me years; apparently, Audiodesksysteme Gläss, a small German manufacturer, couldn't keep up with demand. I've also heard from a few sources that reliability was not high in the company's early days, but that now all that's been sorted out, as has manufacturing capacity. This compact cleaner can be thought of as a very high-tech, automatic version of the Spin Clean Record Washer ($79.95), which I reviewed in my February 2010 column. 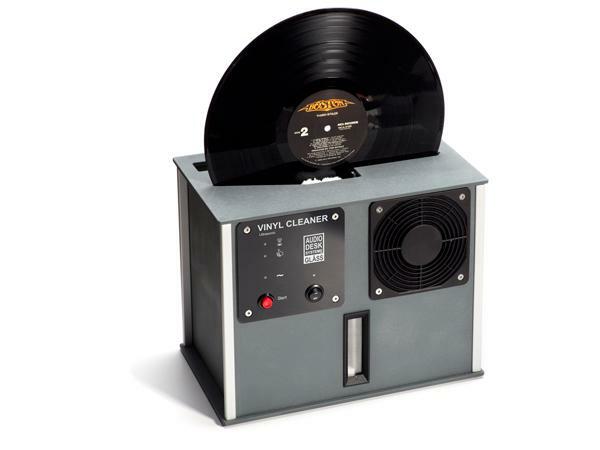 Like the hand-cranked Spin Clean, the Audio Desk Systeme Vinyl Cleaner ($3995) uses a vat full of fluid that can clean many records before it needs to be replaced, and the LP sits vertically in the vat as both sides are simultaneously cleaned. But before Audiodesksysteme and their importer, Ultra Systems, have heart attacks, rest assuredthose are the only similarities! The Audio Desk is fully automatic and, unlike any other record-cleaning machines I know of, it uses ultrasound and a process called cavitation (ie, the forming of bubbles) to clean records, much as an ultrasonic jewelry cleaner does for jewels. If you've ever seen a tarnished piece of ornate silverwork go into such a machine and come out gleaming, even in its tiniest nooks and crannies, you know how well it works. Slip an LP into the Audio Desk's slot, which is lined with soft rubber lips; on the left side, the slot widens into a vat. Push the Start button and the record begins to slowly rotate (it sometimes required a nudge). Fluid stored in a chamber below begins to fill the vat as four bidirectional microfiber drums adjust their proximity to the disc, then begin to rotate themselves, to spread cleaning fluid on the record. 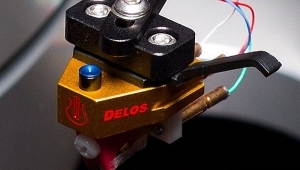 Meanwhile, the ultrasonic condenser fires up, producing soundwaves whose amplitude is high enough to break the liquid's surface tension, causing it to tear apart and leave behind millions of microscopic vacuum bubbles that compress or implode, creating tiny liquid jets small enough to clean inside even the narrowest LP groove (think of the jewelry cleaner). 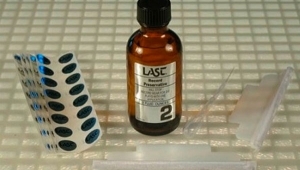 This micro-agitation process washes any contaminants on the record surface into the cleaning fluid. The fluid then drains off through a filter, and the rotation of the LP slows almost to a stop as two powerful fans completely dry the disc. Remove the disc by carefully lifting it vertically, to keep it from rubbing against the rollers, or you'll end up with wet spots. (That happened only a few times.) Your LP is clean and dry and ready to play. The entire process, monitored by front-panel LEDs, takes six minutes. The designer, Reiner Gläss, contends that record-cleaning machines that use surface suction (Nitty Gritty, VPI, Clearaudio) or point suction (Keith Monks, Loricraft) rely on brushes to loosen dirt and contaminants buried in the groove, and that brushes simply can't do the job. Worse, he contends, they often press dirt deeper into the groove. Surface-suction vacuuming, he contends, often smears dirt across the record surface, while the friction caused by rubbing builds up static electricity. Although point suction is somewhat less prone to static buildup, such devices can clean only one side at a time, and still rely on brushing to loosen particles embedded in the groove. The Audio Desk Systeme was the most effective, easy-to-use record-cleaning machine I've ever tried. I cleaned records that I'd already vacuum-cleaned but were still noisy, and the noise went away. Two examples: my original UK pressing of the Beatles' Let It Be and my most treasured classical album, an original pressing of Fritz Reiner and the Chicago Symphony's recording of Strauss's Also sprach Zarathustra (RCA Living Stereo LSC-1806). The latter looked clean when I bought it but was hopelessly noisy. Repeated cleanings over the decades since, using more sophisticated fluids and machines, have made it quieterbut finally, after treatment with the Audio Desk, it's just about completely silent. The machine is, too. The six-minute cleaning cycle is not a problem because it's entirely automatic. I went on a record-cleaning spree, managing a personal best of 120 LPs cleaned in two weeks. Not having to stand there and clean one side, then turn the disc over to clean the other side, made all the difference. Downsides? You're limited to Audio Desk's fluid, an alcohol-free, biodegradable concentrate said to have excellent antistatic properties (it does). You add a 20ml bottle ($14.95 each, or $75 for a six-pack) to a gallon of distilled or, much better, reverse-osmosispurified water (eg, Aquafina, or from your own reverse-osmosis system). That's good for at least 50 records until you have to start topping it up (a flashing LED tells you when to do that). Mix up a second batch and add as needed. The microfiber cleaning barrels ($99.95 each) need to be replaced every 500 to 1000 LPs, depending on how dirty they were to begin with; the fluid should be drained and replaced, and the filter rinsed, every 100 to 200 records. I'm out of space, so I can't answer skeptics' other obvious questions, other than to say that really dirty, crusty records should be pre-cleaned. I use MicroCare's Premiér! or an Orbitrac, and I still keep Enzymatic fluid around to deal with moldy records. no doubt it does a magnificent, god-like job at ca. $4000i.. Another toy for the 1%...and an ever so necessary, 'must have' accessory for reviewers... at accommodation pricing. Of course it will require effort and you don't have the satisfaction of spending $4000 and bragging to your friends how gullible you were. I was very impressed with how clean and quieter a noisy album of mine was after bringing it in to the NYC Audio show to try the machine. Thinking how I can bring it into the house without my wife asking how much it's worth. My only concern is that I did notice a lot of moving parts as it goes from wash to dry etc and was concerned about its longevity in doing all this work on a regular basis. Other than that I believe this record cleaner might spawn a new generation of record cleaners from other manufacturers - I believe it represents a paradigm shift in record care. Would love to have one. Can you still buy Orbitracs ? They were a great manual, pre-machine cleaner. I thought they went ot of production years ago. The most improvement from any component ever! I've had my Audio Desk for about 8 months now. I am not one for superlatives and look skepticaly at reviews and reviewers that use phrases like jaw dropping etc. But this thing represents the most profound improvement I have ever heard in any system I've owned. I've had a Keith Monks cleaner for about 30 years and thought it did a wonderful job of cleaning records. It did and still does. But the Audio Desk doesn't just clean records, it transforms them. Whether old or new, a clean in the Audio Desk uncovers sonic virtues not heard before. Shortly after getting the machine my wife and I had been enjoying an original Seraphim of Maria Callas's 1953 recording of Norma.....We were both in awe of the recording and the pristine condition of that particular 60 year old disc. Not a pop or click. Wonderful sound in all respects. how could it be better? Then I cleaned it on the Audio Desk. When I cued it up I swear Callas was in the room with me. It was almost scary. A while later my wife returned to the room and I cued up the record again. Within two bars my wife, not an audiophile at all, exclaimed with a start..."my god, she's in the room!" Every record I clean reveals, to a lesser or greater extent, all the atributes we search for in our quest for better sound. I have a very nice system comprised of individual components each costing about 5 times the price of the Audio Desk, but not one of them has had the impact that this machine has on my listening pleasure. It is hands down the best component I have ever purchased during the 40+ years I have been involved in the hobby. Doubters doubt-on but vinyl lovers with large collections and/or wallets should get this cleaner now. You absolutely will not regret it. Fred: I find that turning the record just slightly in an anti clockwise direction after inserting it into the slot will always result in it rotating when it should. I deleted a comment from GeorgeHolland that was negative and added nothing to the discussion.Please, everyone, if you post a comment to this website, be constructive and if you disagree with someone, be respectful. Address the argument, not the arguer. If you do that then it's no longer a discussion but just yourself deleting anything you don't agree with. "But the Audio Desk doesn't just clean records, it transforms them. Whether old or new, a clean in the Audio Desk uncovers sonic virtues not heard before"
I'm sorry but just cleaning a record will NOT uncover sonic virtues. Perhaps changing the cartridge or even changing the stylus WILL. A record that has been already played several times will have any dirt or dust "welded" into the walls of the vinyl and no cleaning machine can remove that.It will remove some surface dust and grit. You will recall that I posted a link to a DIY cleaner or I wouldn't have bothered if I didn't think it was worthwhile. Simply changing the stylus to another type oe even a different brand(conical versus eliptical) allows the stylus to play part of the groove not reached before. It's simple mechanics. ".We were both in awe of the recording and the pristine condition of that particular 60 year old disc. Not a pop or click. Wonderful sound in all respects. how could it be better? Then I cleaned it on the Audio Desk. When I cued it up I swear Callas was in the room with me. It was almost scary." So how does a 60 year old record that doesn't have any pops or ticks improve by a simple cleaning to becoming "life like"? Expectation bias is my theory. You spend $4000 and of course the sound gets "in the room"
How many times have we all heard the "wife" story ? Just asking because most wives can't be bothered and don't care. "It is hands down the best component I have ever purchased during the 40+ years I have been involved in the hobby." This is the part I find hard to swallow. So different speakers, speaker placement or room treatments haven't made as big an improvement as this record cleaning machine? Have you been to mauidj's house, Georgie? You keep throwing out that false canard. I didn't delete your post because I disagreed with it - you can, in fact, find many, many postings where it is obvious that I don't agree with the content but didn't delete them - but because you were being insultingly disrespectful of another poster to this forum. If you cannot behave in an adult manner, then I will eventually have no choice but to block you from posting. Consider this a formal warning. No one had anything worthwhile to say against the points I made so I assume no one thinks they are wrong. Thank you. Sorry, Georgie, that's not good logic. I wasn't going to be drawn into this silly fracas but GeopregHolland is suggesting that he and only he is right well.......he's wrong! First up GeorgeHolland...what points did you make? They were not points. They were kind of insulting and full of inuendos that contain absolutely zero factual elements. But hey...I've got a thick skin so no worries! I have been involved in the hifi business since 1970. First as a technician. Then in sales and marketing. Then as a part time writer and reviewer and now as a hobbyist and fan. I have in those years had many revelatory experiences vis a vis equipment, software and sound. I am not prone to exagerations or lies and your suggestions not withstanding, I will not have you imply that I am. Why are you so insistant that my experiences are bogus? What do I have to gain from stating the things I did? To make myself feel better about my purchase. Are you kidding? Life is way too short. "I'm sorry but just cleaning a record will NOT uncover sonic virtues. Perhaps changing the cartridge or even changing the stylus WILL. A record that has been already played several times will have any dirt or dust "welded" into the walls of the vinyl and no cleaning machine can remove that.It will remove some surface dust and grit. You will recall that I posted a link to a DIY cleaner or I wouldn't have bothered if I didn't think it was worthwhile. Simply changing the stylus to another type oe even a different brand(conical versus eliptical) allows the stylus to play part of the groove not reached before. It's simple mechanics"
So I assume you have heard records before and after cleaning on this machine...right? Otherwise how exactly can you make this statement of FACT? Simple mechanics eh. There is nothing simple about it! You state that it will only remove surface dust and grit. Well sir you are 100% wrong. That is the point of the Audio Desk. You challenge my personal observations but offer none of your own that are not born out of your own bias and suppositions. A stylus change MIGHT alter the sound? Come on....that is just silly. Of course it alters the sound. Just as this cleaner does. "So how does a 60 year old record that doesn't have any pops or ticks improve by a simple cleaning to becoming "life like"? Expectation bias is my theory. How? Well I really don't know. But I do know that it did. And it's anything but a "simple" cleaning. Why are you calling me out over my actual experience? You have had ZERO expereince! Go try one of these cleaners then come back and dispute my findings. Until then you are the one guilty of expectation bias. You offer absolutely no proof that I am wrong...NONE! I said that the results varied from record to record. Some were very subtle..others quite the oposite. This particular disc was the later. You spend $4000 and of course the sound gets "in the room"
I spent more than that on power cables and conditioners and they did not even get close to improving the sound like the Audio Desk does....as I said on many but not all records! I certainly did not find it necessary to justify those purchases by fooling myself or others. "How many times have we all heard the "wife" story ? Just asking because most wives can't be bothered and don't care." "This is the part I find hard to swallow. So different speakers, speaker placement or room treatments haven't made as big an improvement as this record cleaning machine?" That is correct. And you can refuse to swallow it if you chose but that is what I and my wife heard and continue to hear. I'm sorry (actually I'm not) if you can't or don't want to believe my impressions but that is what we heard. THE END. Not subtle. Big difference! And I'm not the only one. Read the reviews from writers and users. Most gush forth with superlatives as much as I have...for good reason. GeorgeHolland...you should be excited by the fact that there are things out there that can improve sonics and the hifi experience. Not so down about a product and person (who you don't even know) that it causes you to be so negative. Come on mate....put on a record and enjoy the hobby we all love. It's supposed to be fun not confontational. Peace and Aloha to you! "So I assume you have heard records before and after cleaning on this machine...right? Otherwise how exactly can you make this statement of FACT? Simple mechanics eh. There is nothing simple about it! You state that it will only remove surface dust and grit. Well sir you are 100% wrong." "This machione" isn't some wonder machine that uses unknown technology. If you had bothered to read the link I provided way above your post, you would have seen a DIY cleaner that works just as well and costs far less. Either a cleaner can remove surface grit and that embeded into the walls of a record or it can't and I say NO cleaner can remove grit embeded into the vinyl by the friction and heat of the stylus after many playings. "Until then you are the one guilty of expectation bias. You offer absolutely no proof that I am wrong...NONE! I said that the results varied from record to record. Some were very subtle..others quite the oposite. This particular disc was the later." Sorry but just because you wrote a lengthy post isn't proof that what you "heard" was real. Since you are the expert on this machine please explain how just cleaning a record gave such profound results? It's not possible. MAYBE it reduced the surface noise a bit but then again I doubt it. "I spent more than that on power cables and conditioners and they did not even get close to improving the sound like the Audio Desk does"
I don't doubt that you did spend more than that on cables and power conditioners. Doesn't mean that they made one ounce of difference though. Expectation bias does do that ya know. "That is correct. And you can refuse to swallow it if you chose but that is what I and my wife heard and continue to hear. I'm sorry (actually I'm not) if you can't or don't want to believe my impressions but that is what we heard. THE END. Not subtle. Big difference!" This is where your credibility falls apart big time. Sorry but simply moving a speaker a few inches would make more of a sonic difference than ANY record cleaning machine. If you don't realise that then you have zero knowledge or experience of doing so and what acoustics are all about. No I don't believe your impression. "And I'm not the only one. Read the reviews from writers and users. Most gush forth with superlatives as much as I have...for good reason." Uhhhh so what? You can read the same thing about power cables, audio cables and magic bowls but it doesn't mean they are correct. "GeorgeHolland...you should be excited by the fact that there are things out there that can improve sonics and the hifi experience"
Oh I know what those are too, just not a $4000 record cleaner. Remember that I did link to a DIY record cleaner. Carefully placing the speakers, taking care of room acoustics and having some idea what does or doesn't work goes a long way towards better sound. I'm happy you like your record cleaner, just not convinced that it's all you make it out to be. The best and only proof needed is that you have absolutely no experience with anything that you write about. If you would like more than 2 sentences, then mauidj said it much more fully and eloquently than I.
I used to work in the jewelry industry and we had an ultrasound machine to clean rings and such, it got all the grime out of rings and bracelets that nothing else could. If you put your hands in it you could feel it start to prick your hands. 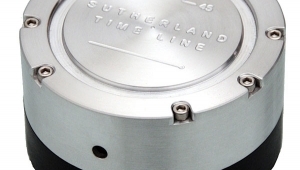 Of course we would never put a watch in as it would penetrate the casing. When I heard it used the same method I knew it would not be snake oil. give it a spin. "BUT it won't remove grit that has been already embeded into the walls of the grooves themselves by the playback stylus. Those nasties are in there for good"
How do you know it will come out? What you've never experienced, you can only imagine. People who use these products, they actually hear. People who have heard the results of using this product say so. "Getting a review sample of this unique ultrasonic record-cleaning machine took me years; apparently, Audiodesksysteme Gläss, a small German manufacturer, couldn't keep up with demand...."
"Carefully placing the speakers, taking care of room acoustics and having some idea what does or doesn't work goes a long way towards better sound. I'm happy you like your record cleaner, just not convinced that it's all you make it out to be." I have a way better idea of what works in this instance. I've tried it and heard it . By you own admition ...you have not. Everything you have said is conjecture until you actually try one. Way better idea hmmmmmm? Happy for you. Happy for myself not spending $4000 on a record cleaner. Conjecture abounds everywhere it seems. You are happy that you don't buy things that make you unhappy? Is that right, Georgie? Apparently, "conjecture" sells $4000 record cleaners very well! "Big difference between cleaning jewelry and a record with ultra sonics." No it isn't the principle is the same the ultrasound gets out dirt using the same methods. As much as I appreciate and respect (George Holland) your comments in your posts, I have to say that if anyone hasn't tried this unit with their own records or a demonstration of its sonic benefits, then one is undermining their own position by criticizing it. I am one big doubting Thomas when it comes to a lot of gear, usually finding it overpriced with laws of diminishing returns kicking in, and sometimes take years before I make a decision to drop my hard earned money on an upgrade. But if I was working at JP Morgan or Goldman Sachs and was due for a bonus, I would order this conraption, and I have never come out to say this about any gear that has appeared on Stereophile, this machine really impressed me. Amusing feedback...I am not a vinyl junkie by any means but $4000 for a cleaner is definitely for the 1% IMO...this is the problem with high end audio...its turned into a hobby about the equipment. I have been there too. The quality of the music starts with the source...music from the 50's for the most part has been well produced and recorded...the idea that a machine can improve upon whats there to begin with is ridiculous IMO. IF the record in question is dirty then yes of course it will sound better..while I have not purchased this 4G machine I have taken records to a local dealer that has cleaned them with a VPI and ClearAudio machine...NO difference at home..those were sub 1G machines that had little effect. Needless to say I have never purchased a record cleaner..I have cleaned them myself with some RO water and dish soap...works just as good for my set up. Is there not an expectation that vinyl has clicks and pops because thats the medium? I would love to see the breakdown of cost for charging such a large sum of money for technology that has been around for decades..is it made in Germany? Even so, still overpriced like everything audio these days. Ultrasonic record cleaning that's affordable for everyone! The Audio Desk Vinyl Cleaner has been improved since it launched in 2009, and the Klaudio KD-CLN-LP200 has been available since May 2013, so there are now choices for those who want their own machine, as both the Klaudio and Audio Desk are excellent machines that give great cleaning results. Or you can use an affordable service like Record Genie to try ultrasonic cleaning, and just pay for what you need, by the record. See www.recordgenie.com or www.facebook.com/recordgenie and read what customers are saying. Pricing as of 3/1/2014: 5 minute "single" cleanings are $2.75 per record including new inner sleeve (your choice of Audio Desk or Klaudio machines) OR for the ultimate "double" clean it's $5.00 per record for 10 minutes of ultrasonic cleaning using BOTH machines, Audio Desk first, then Klaudio, gives the benefits of both! New customer "Try It Out" special available, and bulk discounts too! Have had this cleaner for 1,5 years, this is now the second time that it is on service, it has now taken 4 months and I still haven't received it back. Don't remember how many months it took the first time, but my patience with this company is soon gone. When the machine works, it's great, but I don't think this is tested enough yet, the releability and service time of a clener in this price range is far away from what it should be. If I now had to choose what cleaner I'd buy, it would surely be something else, sorry to say, but this is the fact. Visit the Cleaner Vinyl website at: cleanervinyl.com and have a look! I purchased the Cleaner Vinyl One several months ago in anticipation of the arrival of my new turntable (Mofi Ultradeck + M), which replaced my old stalwart of 45 years, a Philips 212. Yes! I’m that old! Along with the Cleaner Vinyl One, I also purchased a couple of their add-on adapters called Cleaner Vinyl Two so I could clean 3 records at once. I was tempted to buy the Cleaner Vinyl Pro because it cleans many more records simultaneously but wanted to try this technology, first, before investing that kind of cash. Of course, I also purchased an ultrasonic cleaning machine, which is required for this system. The Cleaner Vinyl One is, basically, the motor that rotates the records in the ultrasonic bath. The entire package, including the ultrasonic cleaning machine, came to less than $400.00. Essentially, what you are buying from Cleaner Vinyl is a motor and as many of their nifty attachments as you like. What you are also buying from Cleaner Vinyl, of course, is their ingenuity and innovation, which, in my opinion, is well worth the price. Here’s how I use the system: I start by cleaning 3 records simultaneously in the ultrasonic cleaning machine filled with Mofi’s Super Record Wash solution, which is nothing more than distilled water and a mild surfactant (no alcohol). You could make your own cleaning solution concoction more cheaply but I like Mofi’s stuff and I’m lazy. Next, I rinse the records in a Knosti (same as a Spin Clean, only German) with distilled water. The Knosti, which you don't have to use, adds about $80.00 to your investment but total outlay is still under $450.00. Next, I dry the records with high quality microfiber cloths and allow them to air-dry completely and thoroughly in Knosti’s record stand. You could use a good dish rack, instead. Lastly, I treat the cleaned records with Last Record Preservative. Keep in mind, here, that my record collection is in good shape. I’ve always stored the records properly, used anti-static poly sleeves, a Watts Disc Preener before every play in the old days, Discwasher D4 before every play in later days, hand-washed the records in distilled water & mild dishwashing detergent (no alcohol) occasionally over the years and, basically, did everything I knew or was given to understand to preserve them, short of rocking them to sleep in my arms. The records were never played on anything other than the Philips with carts like modestly-priced Shures, Empires, Stantons, ADTs and others along the years. The styli were brushed & cleaned occasionally (probably not as often as they should have been). The records were never played at more than 1.75 grams VTF on the Phillips (Baerwald geometry) and the TT was always lovingly cared for. No one went near that TT but me! I can easily imagine just how much more dramatic the results would be on records that were in tougher shape! The results: the records came out shiny clean and looking new … not like new but NEW! All … and I mean ALL … traces of surface noise was completely and remains completely eradicated, even at 55% and 60% gain on a McIntosh MA 5200 and Paradigm Studio Monitor towers! Some clicks & pops remain. However, these records have been played a lot over the many years I’ve had them and, of course, without the benefit of the technology we have today, not to mention the Phillips' limitations. I intend to continue my research and trials with other cleaning solutions to see if it might be possible to get rid of more of those annoying clicks & pops. If you folks have any suggestions, I’m all ears! I also intend to buy some new vinyl because of the way the Mofi Ultradeck + M makes them sing! In conclusion, this Cleaner Vinyl system is the best damn record cleaning system I’ve ever used. It beats cleaning or washing records by hand, by a long shot! Although I’ve never used a vacuum cleaning system, I see no sense in spending that kind of cash for something that cleans only 1 record at a time, one side at a time and without the advantage of cavitation. I’ve also never used or heard the results of using one of those 4 or 5 thousand dollar ultrasonic cleaning machines either. However, Cleaner Vinyl employs the same technology (i.e. ultrasonic cavitation) and those 4 and 5 thousand dollar machines only clean 1 record at a time! Why not spend the cash you'd save on more music? Also, the folks at Cleaner Vinyl (i.e. Rudy) could not possibly be more helpful, providing guidance, answering questions, etc. Visit their website and see for yourself! It'll be well worth your time and well worth your investment! P.S. Prior to my purchase, I was a little apprehensive about the possibility of the record labels getting wet in the cleaning process and was prepared with a home-made version of label protectors, just in case. Rudy was right! As long as you use a modicum of care taking the records out of the bath after cleaning, this is not a problem at all. May the music be with you, always! Enjoy!